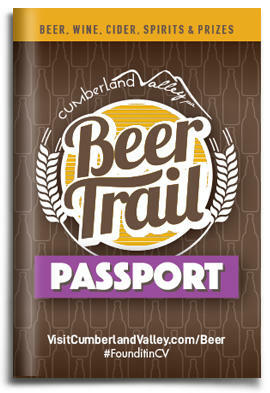 To participate in the Cumberland Valley Beer Trail, pick up a passport at a participating location and request a sticker when you visit a location listed inside. Passports can also be picked up at the Cumberland Valley Visitors Center in downtown Carlisle. Why aren’t all of the participating locations open? We’ve included a few locations on the Beer Trail that will be opening soon. Since the passport is a printed piece, we wanted to make sure information was available for when the location does open. These locations are not required to visit for the passport holder to be eligible for prizes. There are several different versions of the passport. Which one do I use? How do the prize changes work? We printed the first passports in April 2017, and quickly received feedback about the locations and prizes. We continue to reprint new passports as we run out, and there have been some slight adjustments to the prizes. We will honor or exceed the prizes on your submitted passport.If you are currently working on an old passport and pick up a new passport to go to new locations, just send both passports in together. Please allow 4-6 weeks for your prize to be delivered. We will try our best to accommodate t-shirt sizes. Is purchase necessary to receive a sticker? No, purchase is not necessary to receive a sticker. Cumberland Valley Beer Trail stickers are NOT PERMITTED TO BE SOLD. If you are offered a sticker for purchase, please contact us! Can I turn in more than one passport? Yes, we encourage you to continue to support our local breweries, but please understand that prize supplies are limited. We will do our best to accommodate multiple passport submissions. I own a brewery/I am opening a brewery; how do I participate in the Beer Trail? The Cumberland Valley Beer Trail is open to breweries in Cumberland Valley. Send an e-mail to beertrail@visitcumberlandvalley.com to tell us about your brewery! Can restaurants participate/why are there restaurants on the trail? The first version of the passports included specialty restaurants. Moving forward, no additional restaurants will be added to the passport.